After being freed from Imperial Slavery by Juno Eclipse, he joined the Rebel Alliance. He also successfully recruited all of Mon Calamari to the cause. He fought in many battles and played a major role in securing the New Republic, after the Rebel victory on Endor. He’s also an AMAZING singer! Who knew?! Admiral Gial Ackbar, I salute you with a batch of cheesy goldfish crackers, shaped like your face. In the bowl of a stand mixer fitted with a paddle attachment, mix together the cheese, butter and salt. Add the flour, and mix until pebbly. Slowly add the ice water, and mix until the dough forms a ball. You may not need all the water. Shape the dough into a disc, wrap in plastic, and place it in the fridge for half an hour. Line two baking sheets with parchment paper, and set aside. Divide the dough into 4 pieces, and roll each portion to about a 1/4″ thick. Using an Ackbar cookie cutter, cut out your crackers, and transfer them to your prepared baking sheets. 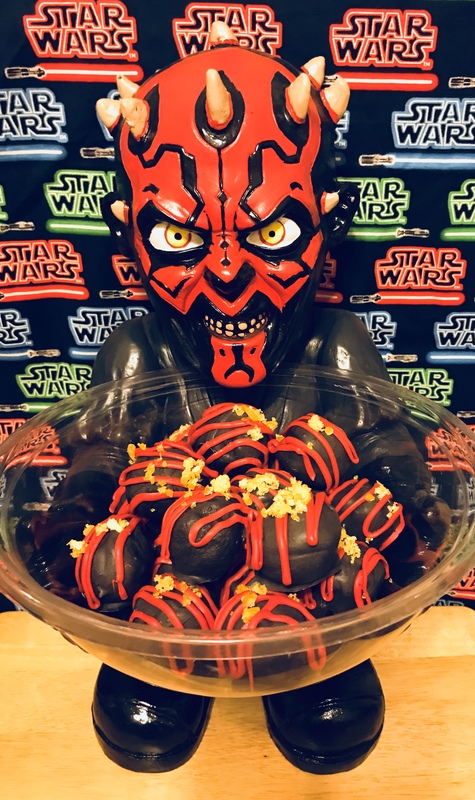 With this particular cookie cutter, I used one side to cut the shape of Ackbar’s Head, then I flipped the cutter over and stamped his face on top of the shape. Bake for 15-17 minutes, or until puffed and browned at the edges. Place on a wire rack to cool. Store in an airtight container for up to a week. 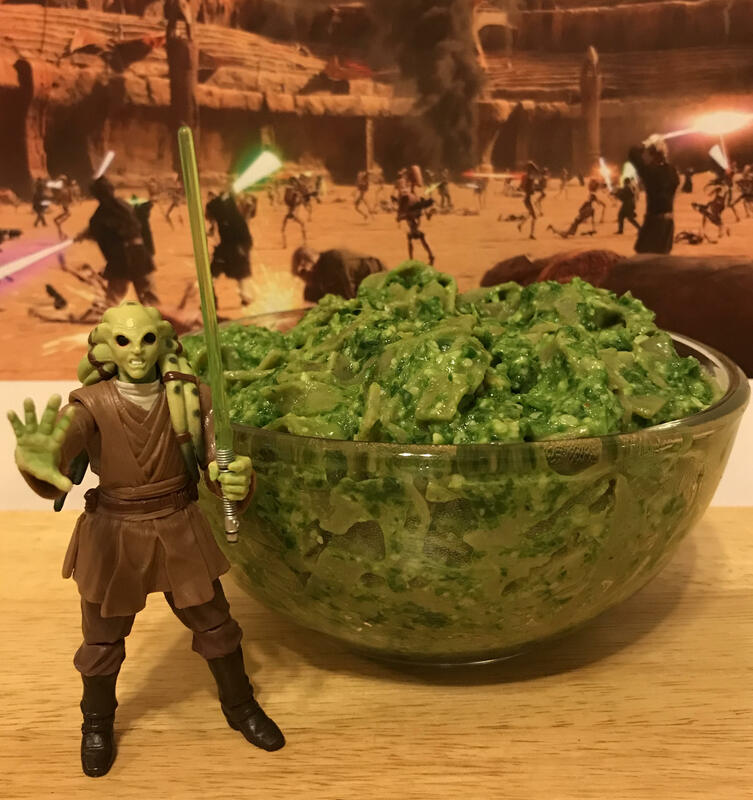 It’s been an honor snacking with all of you. I couldn’t have said it better myself. Here’s to all the Dewbacks we’ve known and loved. 1. Pre-Heat oven to 350 degrees F. Line a cupcake tin with baking cups, and set aside. 2. In a medium-sized bowl, whisk together flour, baking powder, and salt. Set aside. 3. In the bowl of an electric mixer, beat butter and sugar together until light and fluffy. 4. Add lemon and lime zest, and continue to beat. 6. Add the flour mixture in 3 parts, alternating with Mountain Dew. 7. Add lemon and lime juice, as well as the lemon extract, and continue to mix until everything is well combined. 8. Fill baking cups about 2/3 full. 9. Bake for 18-20 minutes, or until a toothpick inserted into the center of one cupcake, comes out clean. 10. Allow to cool in the pan for 10 minutes, before removing to a wire rack to cool completely. 11. To make the frosting: In the bowl of an electric mixer, beat the butter until it’s light and creamy, about 3 minutes. 12. Add the Mountain Dew, lemon zest, lime zest, lemon juice, lime juice, and lemon extract, and continue to beat. 13. Add powdered sugar and beat well. 14. Add drops of green food coloring until desired shade is reached. 15. Frost completely cooled cupcakes, and sprinkle with green sanding sugar. 16. Enjoy while searching the deserts of Tattooine for a jettisoned escape pod. First, let me just say that Obi-Wan Kenobi is #1 on the short list of Jedi I’d make-out with (Alec or Ewan). He’s one of my all-time faves. I love his whole story! He trained two Skywalkers, defeated Maul AND Grievous, plus he’s got a glorious beard that has always served him well whenever he needed to ponder something.Sure, maybe he should have finished Anakin off once and for all, but we needed him to (eventually) throw the emperor down that shaft.Bad feelings and happy landings all came together to make him a key figure during the Clone Wars and during the following rebellion against the Empire. Han may have considered him to be an old fossil, but he’ll always be the Jedi master of my heart! 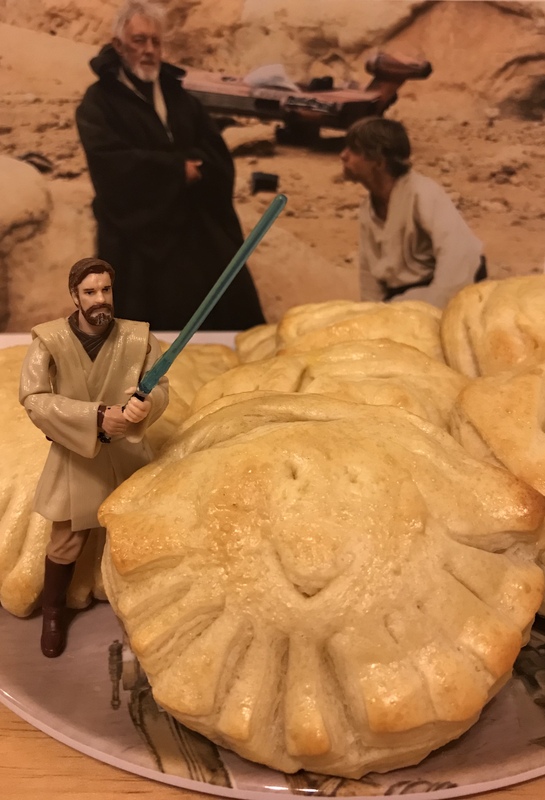 These Dough-Bi-Won Kenobuns are the perfect on-the-go snack for the next time you’re riding a giant feather lizard or chopping off arms at Mos Eisley. 2. Remove the biscuits from the tube and place them on the baking sheet. 3. Using a pair of scissors, cut a beard into the bottom half of each biscuit. 4. Use a toothpick to poke eyes into each biscuit (don’t be afraid to make the eye holes big, they’ll shrink during baking). 5. Using a knife, slice a mouth and hair into each biscuit. 6. Brush the face of each biscuit with beaten egg. 7. Bake for 13 minutes. 8. Enjoy while living life as a crazy old hermit.